10 days ago I had an itch… an itch that I was not sure how to scratch! I was itching to ride my bike and I was itching for adventure! This was unexpected, as I had actually been home for a whole week for the first time all year, so I did not know what to do about it! When I called Sara to check that she was safe on the road, I told her about my itching feeling – and she wisely advised me that I was always welcome to ride on the tour with her… OF COURSE! I could scratch my itch! So I spontaneously booked a ticket, had my bar tape swiftly replaced by Jake at Hutch’s, packed my bags with bike and beach clothes and two days later I was utilizing my rapidly growing supply of frequent flyer miles – heading eastwards to rent a car and support the School Food Tour! I was excited by the potential of new places to visit, but did not take time to research my destination, so I was not sure what to expect. 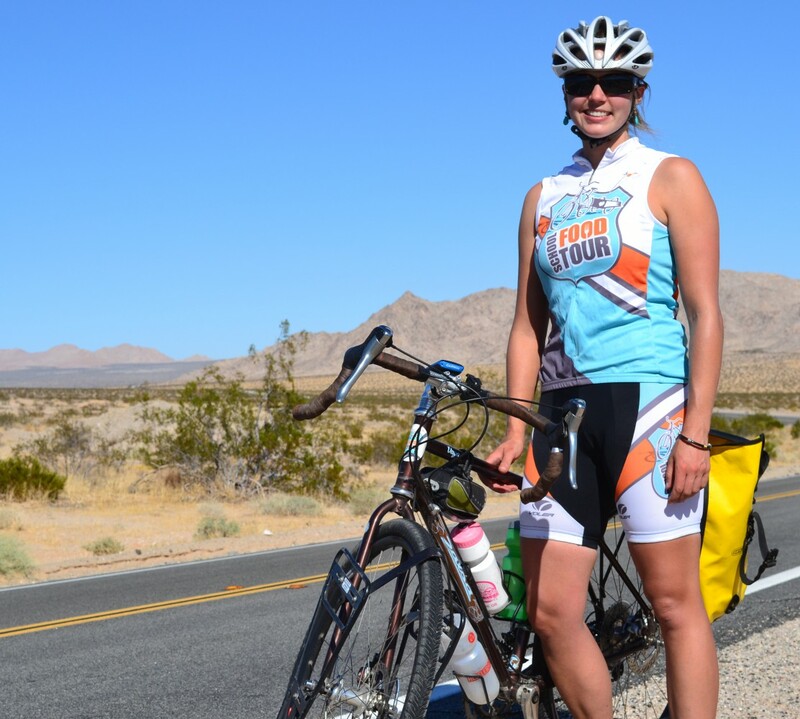 All I knew was that it would be very different from my desert stint on the Tour last November, and that I did not want to miss out on experiencing new places by bike! I met Sara in Mississippi, and upon arrival at the coast I was greeted by torrential rain… “Oh no what have I signed up for? Is Sara crazy? Am I crazy? This idea is crazy! Has Sara washed away?” ran through my head as I imagined sitting stationary at the beach and watching it rain all week. But Sara reported that the sun was shining where she was, so I parked the car and took off on my bike to ride through the puddles in pursuit of the patch of blue sky and found her happily pedaling in my direction. 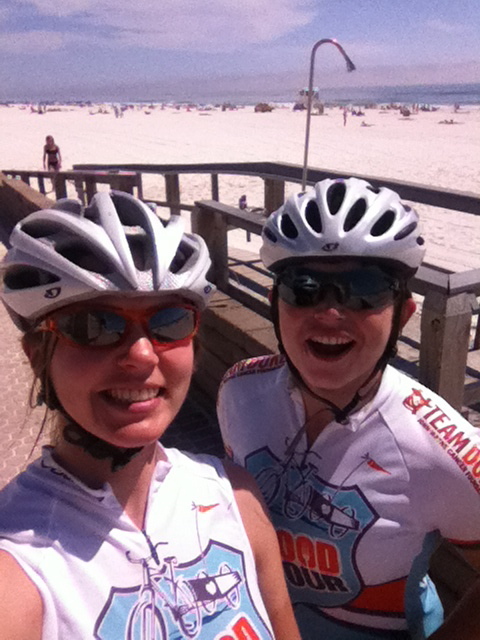 From Mississippi, I accompanied Sara across the coast of Alabama and the north west of Florida. There was no more rain, just foggy mornings, sunny afternoons and spectacular sunsets. We spent a few days riding past beaches of perfect white sand, negotiating bridge crossings, tackling head winds, spotting cool sea birds and avoiding spring break traffic. The highlight was the refreshing swim in the ocean after each day of riding. Just what I needed to satisfy my itch! I am a little disappointed that I didn’t see an alligator, but I got to eat some – thanks to Bobby from Liquid Surf and Sail. Once again, supporting the School Food Tour was a wonderful and rewarding experience and a valuable lesson learned – that if you have an itch to do something – scratch it! You might just find yourself riding your bike somewhere spectacular! Alas, my brief Gulf Coast stint of the Tour is over as I am back to work and on a plane en route to a conference. I can’t wait to join Sara again in a few weeks… maybe you are itching to do that too?! Lunch break by the beach. Side note from Sara: The moral boost that I receive when someone joins me on the road is invaluable. Thanks, Felice, for making the trek down to the south!